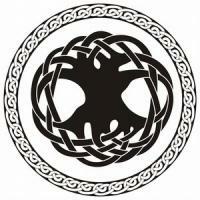 The Celtic tree of life tattoo symbolizes this ancient culture's views on spirituality and the connection between heaven and earth. To the Celts, trees weren't just plants, they were highly spiritual beings that bridged between the worlds. 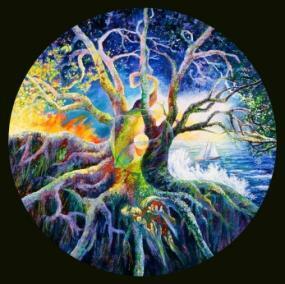 The tree of life itself was believed to support life. Its roots were set in the underworld, its branches stretched high into heaven, and its trunk existed in the earthly plane. The Druids believed the tree was a conduit between the worlds and that the gods used it to communicate with the humans below. 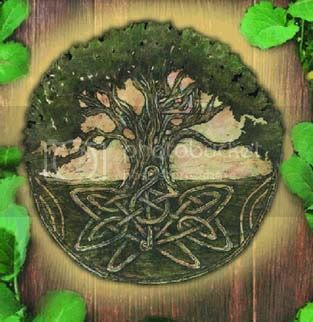 It's also interesting to note that although the Celts believed in the tree of life, it wasn't until around 800 A.D. that the symbol was created. 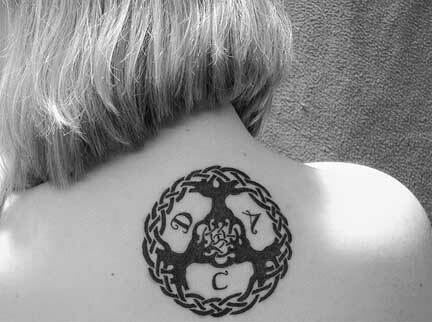 No matter how fanciful Celtic tree tattoos get, they have three basic elements in common. First, each design needs strong roots that symbolically reach deep into the ground. Second, the imagery needs a strong trunk. Third, multiple branches reach toward the heavens. These are the main elements of the design, but you can be as creative as you want with the details. Knots are a major component of Celtic designs, and the tree of life is no exception. In many tattoos, the branches and the roots entwine around each other to form an unbroken ring of knots that frames the entire work of art. In other designs, the roots and branches form separate bundles of knots connected only by a twisted trunk. A knot work tree is the classic representation of this design. The Celts held that there were seven forms of life, and any or all can be incorporated somewhere within the tree to create a very vivid design. So, how can these images enhance your tat design? Imagine a gnarled trunk that, on closer inspection, reveals the withered face of a man or woman. The leaves of the tree might also include birds on the wing. How about writhing snakes amongst the roots of the tree? As you can imagine, there's no shortage of combinations you can use to make your tree of life tattoo different from any other you've ever seen. When you're working with a knot work tattoo design, it's often best to stick with a single color in light and dark values so you don't loose the essence of the knots themselves. However, you might want to consider going the fantasy route and make use of a rainbow of colors in your design. This would look especially good if you decide you really do want to incorporate creatures and other enhancements to your basic tree. Since this tattoo literally cries out for details, it usually winds up being a bigger piece than the average tattoo. This makes it a good candidate for a back or chest mural so you can take advantage of the larger canvas. That said, it is possible to create a simpler and therefore smaller design that will fit on an upper arm or ankle. The following websites have a number of tree of life designs you can contemplate to gain inspiration for your personal tattoo. Rather than copy one outright, try to put your own spin on it or give your tattoo artist the freedom to modify the design for you. This way, you respect the original artist's work, and you won't wind up with the exact same tattoo as someone else. Your design should always have personal meaning for you. Tree of life designs may all have some basic elements in common, but you can use your individual sense of style to make your own tattoo special.